On your Polycom Cloud Phone, the Home view displays your phone line and messages settings and information. 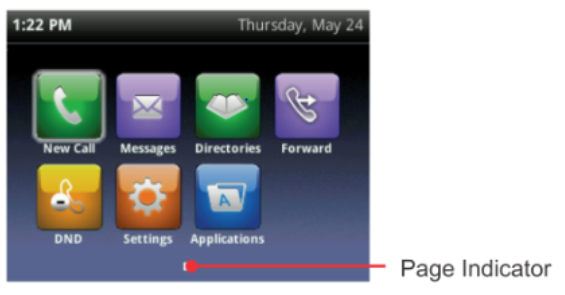 At the bottom of Home view is a Page Indicator that shows how many pages of icons Home view displays. You can get to the different phone functions from the Home View. Just use the navigation key to scroll through the options, then press the Select key to access the desired menu. New Call – Make a new call and see your call history. Messages—Select Messages to access your voicemail. Directories— Access your Contact Directory, Favourites and recent calls list. Settings – Basic and Advance Call Settings. Access phone features and to customise your phone. Applications – Web apps like Google. Do Not Disturb (DND) – Enabling DND stops your phone from ringing and sends all incoming calls directly to voicemail. All calls you receive while DND is enabled are logged to your Recent Calls list. Your Polycom Cloud Phone systems gives you Video and Voice in one. Combining advanced IP telephony, best-in-class desktop productivity and unified communications for businesses of the future. We hope the above information was useful for you, if you would like any more help or advice on using your Cloud phone then please, give us a call on 0800 505 3350 or drop us a contact form and we will be happy to discuss this with you. Alternative why not visit our Cloud telephone systems page where you can find out more about this great technology and see how it could improve your business.